We have updated to Spigot 1.8.6! Update (May 30): Some players have reported that their money and home locations have been lost. This was caused by a bug in Essentials. Basically before 1.8, Essentials would store a separate player data file for every username. This means that players who changed their name before the 1.8 update would end up having multiple data files for their usernames. After 1.8, Essentials then tried to convert and merge these player data files so that there would be only one file for every UUID, instead of username. However, Essentials would more likely than not, choose an old username that was no longer in use, and thus players who logged in after conversion would end up losing their money and home data. 27 players in total were affected by this bug, but I have restored all of the money and homes for these players. It’s possible that I may have missed some other players, so if you find that you are missing your money or homes, please e-mail me. We’re updating to 1.8.5 at the end of May! Thanks to everyone who helped test and submit bug reports on the Beta Server. After some extensive testing, I’m pleased to announce that we will be finally updating the main server to Spigot 1.8.5 sometime next weekend on May 30th or May 31st. The exact time of the upgrade will vary depending on my availability, but I will try to perform the upgrade earlier rather than later. Note that there will be likely a hour or two of downtime on the main server for the upgrade. BetterShops has been disabled, and will not be installed as part of the 1.8.5 upgrade on the main server. We will install BetterShops at a later date when version 2.0 of that plugin is available, which is expected later in June. Spectator mode has been disabled for all non-staff. At some point in the future when the appropriate plugin is available, we may consider enabling spectator mode for non-staff, but with all teleportation functionality associated with that mode disabled. As a precaution, Trustees and above will no longer be able to create/destroy Essentials signs that change gamemode. This permission has been moved to Moderators and above. Members and above can now access any container, including chests, trapped chests, dispensers, droppers, hoppers, brewing stands, furnaces, jukeboxes, etc. Guests are still denied from accessing any container. Players can now use the /chairs on and off command again. Please note that due to limitations in the new Spigot, your chairs on/off setting will NOT persist across login sessions. Every time you login, your chairs setting will default to “on”, so you must always manually run the command “/chairs off” if you want sitting turned off. The dispensing of Fire Charges has been disabled to prevent griefing. Slime blocks are now restricted to Trustees and above, just like Ice. WorldGuard greeting colour codes have been changed to correspond with Minecraft color codes. This is an intentional change by the plugin, and can only be fixed by manually updating all WorldGuard greetings by hand. Rotating schematics with WorldEdit still causes rails to disappear. Dispensers can still spawn villager spawn eggs. Double stone slabs (43:8) cannot be held in your hand. Workaround: use Polished Andesite (1:6), or have it WorldEdited into place. Custom maps that used black may need to be re-uploaded. The colors of maps have changed, and so black pixels may have changed to brown. This can be seen at Vermilion Gateway Airport (VER). Thank you everyone for your patience in waiting for this update! Beta Server is now open for 1.8 testing! The Beta Server is now open to all players for 1.8 testing! Connect your 1.8.4 Minecraft client to: beta.minecartrapidtransit.net, or minecartrapidtransit.net:35565. Please note that purpose of this server is to TEST features in Minecraft 1.8 and associated plugins. Griefing is allowed for the purposes of testing stuff, but if you’re going on there just to grief, then please go elsewhere. MyWarp has been upgraded to 3.0-beta 1, with some major revamping of its internal configuration and permissions. Please take special care that all warps and commands are working properly. 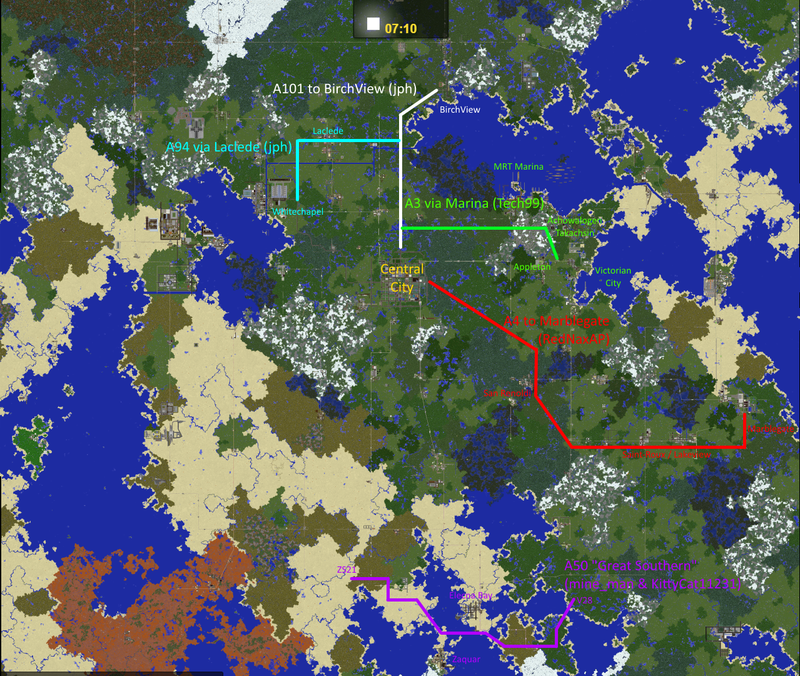 On the Beta Server only, dynmap can be accessed at http://dynmap-beta.minecartrapidtransit.net. However, due to disk space constraints, all dynmap renders have been disabled. The issue with minecarts not getting destroyed by cactus, fire, or lava has been resolved. Dispensers are now prevented from spawning most spawn eggs and prohibited items. Some BetterShops NPCs get duplicated twice for an unknown reason. If you find a bug or issue on the Beta Server, please let the admins know at admin [at] minecartrapidtransit.net. Your help is greatly appreciated! If testing does not find any critical issues in the next couple of weeks or so, then we will likely update the main server before the end of May. Therefore, please get on there and help test so that we can rollout this update to 1.8 faster! Hey folks! The GSM has ended, so here’s what happened! By popular demand, the recording from this meeting is now in shiny MP3 format! You can listen to it here. We have a LOT of promotions to announce! We reviewed promotions for Senator, Governor and Premier at this meeting and are pleased to announce that a majority of promotion requests were approved. If you would like to have your town reviewed (again) at the next meeting, you can send in an application at any time. You can always ask for opinions between meetings, and if we’re not busy studying for IB exams, we can probably give you some insight into what to do. Please send us your airport proposal! And if you want gates at that airport, I hear there will be an application process soon… stay tuned to the subreddit for details. Two years and five months. I’ve passed a lot of time on this amazing server. I’ve made new friends, and I don’t regret any single minute I’ve spent on it. One of the things I’m most proud of is of the work I’ve done and of the people I’ve made happy. I now have the highest rank of non-staff players, and it’s an amazing objective. I’ve been demoted a few times, but that’s helped me to become more mature. I’m now a better person, a more friendly person. People may think Minecraft is a waste of time, but this server never stops surprising me, and I cannot live without it. Next objective? Well, helping grow the buildings, and moderator sounds like a good objective. Thank you to all of the players of the MRT, for making my days on this amazing and unforgettable server. Love you all. Come visit Achowalogen Takachsin! I have lots of shops and houses available. I’m starting to build some high-end condos… I don’t know, I don’t like speeches. We are resuming our audits of inactive towns, like we did on the old world. A town may be considered inactive if it hasn’t been worked on in the last three months (Prism logs clear themselves after 90 days), and its owner hasn’t been online in the last few months. If you notice a town that is inactive, and you want to take it over as a caretaker, email us, and we’ll consider it at the next GSM. We are putting up P14 (Maliwan) and F14 (Villedyn) for auction. If you want to take over one of these towns, send us an email. There have been a few road proposals that people have kicked around for the last while, and all of those A-class proposals are approved for immediate construction. Here’s the map of where the new roads will go (approximately) – click on it for full size. If you want to start a new road project, email us your map and how much you want paid for it. Most of these are being paid less than $1,000 for the road. Please note that A-50 will be player-owned, not server-owned, and as such will receive the designation A-50X. Most of you won’t notice that, but it’ll make administration of the road easier for us. At the last GSM, we realized that the current rules have a lot of gray areas when it comes to inter-city transit. We proposed a new rule set to simplify this. The following rules are NOT in effect yet, and we would love to hear from you on what you think. If your town is below the Senator rank, you can only make and receive inter-city transit lines within a shared municipality. If your town is at or above the Senator rank, you can build outside of an SMP, but your rail lines and stations must be attached to a city. As always, you need to have the approval of that city’s mayor, and they need to be at the appropriate rank. If we do choose to enact the rule at the next meeting, you will have some time to form SMPs and reorganize lines if needed.